1.Multiple pockets, large enough to fit body wash and shampoo bottles,suitable for one person's toiletries on Short/Long-Term Travel. 3.Built-in hanging hook allows more easier hanging and access on the bathroom door, shower rod or towel rack. 4.Light-weight and foldable.Can be folded very easily and thinly when not in use.Very sturdy construction and space-saving design. 5.The durable water-resistant fabric is convenient to wipe clean and dry easily. No need to concern about the penetration of moisture. 6.The toiletry bag can hold almost everything you could need,bring you a clean and comfortable trip,and will be your favorite traveling companion for a long time! 1.Made from water-proof polyester with tidy and fine close stitching, durable hook,smooth zipper and anti-bacterial inner lining. 2.This space saving bag for your carry-on or suitcase is ideal for business trip/vacation.You can also take it with you for a workout at the Gym or to the beach or pool for a swimming session. - Washable: Easily to wash in the water. ❤ LARGER CAPACITY: Size:9.45"W x 7.28"H x 3.74"D.Not too bulky but plenty of room for all your toiletries.Very sturdy construction and space-saving design. ❤ DURABLE MATERIALS: Gtrip portable toiletry bags is made of durable WATER-RESISTANT nylon materials. ❤ SAVE THE MAXIMUM SPACE: Light-weight, portable, foldable, easy to storage. 2 sides ZIPPERED compartment and special designed strong hanging hook make it easy to put and find. 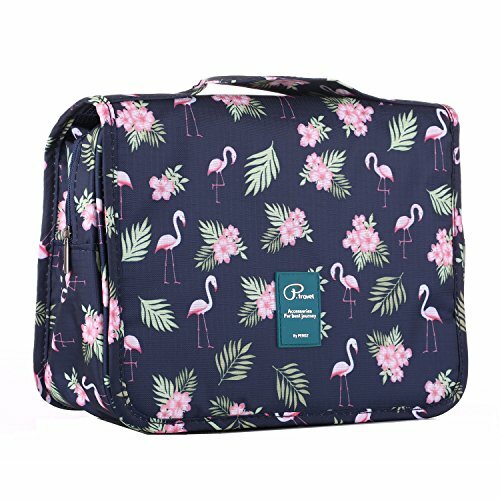 ❤DESIGNED WITH ATTENTION TO DETAILS: The flamingo pattern is cute and fashion.The cosmetic bag has a handle for hand carriage.it also has a built-in strong hook for convenient hanging.